If you are looking for any setting spray for your makeup, look no further! 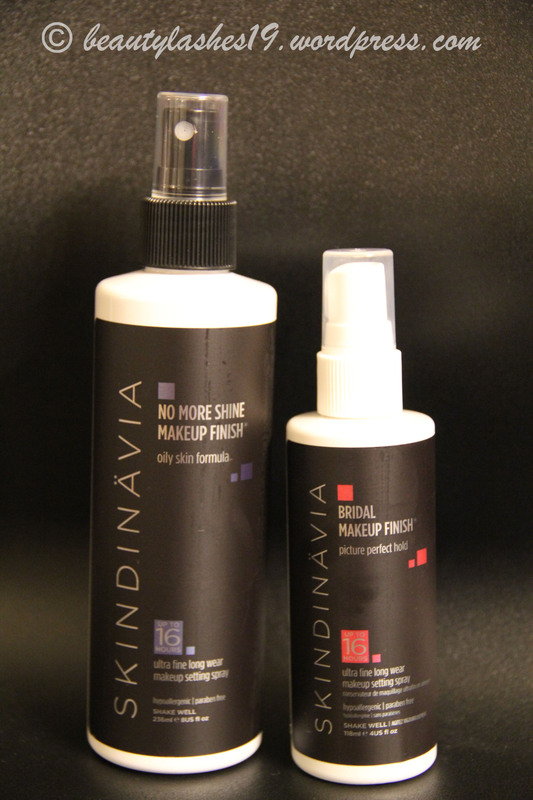 Skindinavia makes one of the best setting sprays I have ever used.. The packaging is simple with a black and white plastic container.. Has a cap/lid on top which is great during travel.. Costs $39 for 8 oz bottle and $29 for 4 oz bottle.. It comes in various formula for different needs.. There’s one for controlling oil production in oily/combination skinned gals (No more shine), one for bridal wear and one for regular use (makeup finishing spray).. I have tried the No more shine and the bridal formula and did not feel much difference between the two on my skin.. The bridal one may have been a fraction more dewy, if any.. but I did not take pics or test under flash photography… That’s for a whole other day..
NO MORE SHINE MAKEUP FINISH: The website describes this formula as “Our over-makeup No More Shine Makeup Finishing Spray gives you a beautiful soft-matte finish, while keeping your skin sheen-free and your makeup perfectly in place. It’s officially time to say ‘goodbye’ to grease. Wave off that shiny complexion and leave your blotting papers at home – this specialized spray provides a weightless matte finish for up to 16 hours. Ideal for oily and combination skin types, our weightless No More Shine Makeup Finishing Spray is the must-have product for controlling oil and keeping makeup shine-free throughout the day.” I have gone through many bottles of this and keep coming back to using it.. It does prolong my makeup and helps reduce the oil production.. does not completely stop oil production though.. BRIDAL MAKEUP FINISH: The website describes the formula for bridal makeup as “Kiss-proof, cry-proof and sweat-proof. Our Bridal Makeup Finishing Spray is the perfect moisture barrier for your big day. Extending makeup wear and controlling stress-induced shine are just two reasons why this award-winner should be every bride’s “something new!”SKINDINÄVIA has solved the vanishing makeup mystery with patented Temperature Control Technology® that forms a lightweight, breathable web on top of your makeup, holding everything in place for up to 16 hours.” That is a lot to claim!! Will try it in the coming months.. The mist is clear, weightless and without any particular scent.. I really enjoy these sprays and definitely see the increase in longevity of my makeup.. Also, the best thing about locking your makeup in with a setting spray is that you can avoid looking all powdery and cakey.. This is especially true for oily/combination skin, where one tends to powder a lot to avoid the shine.. The end result is not very pretty nor natural.. The mist/spray somehow makes your makeup melt into your skin and leaves a natural finish on the skin..